REMEMBER THESE? a: in or to: Je vais a lécole. Je suis a la maison. De: from: Je reviens du supermarché. Je suis de Burbank. 1 REMEMBER THESE? a: in or to: Je vais a lécole. Je suis a la maison. De: from: Je reviens du supermarché. Je suis de Burbank. 4 With names of cities, you use a to express in or to. You use de to express from. Il est a Lyon. Elle arrive a Nice demain. Elle part de Paris. 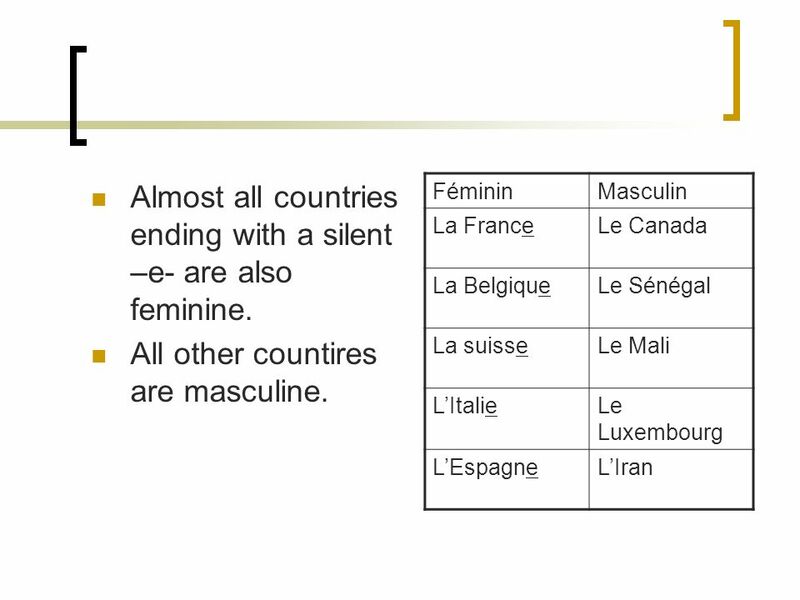 7 LES PAYS ET LES CONTINENTS You use en to express in or to and de/ d with all continents, feminine countries and masculine countries that begin with a vowel. Jhabite en Europe. Je reviens dEurope. Je vais en Belgique. Jhabite en Iran. Je viens dIsraël. 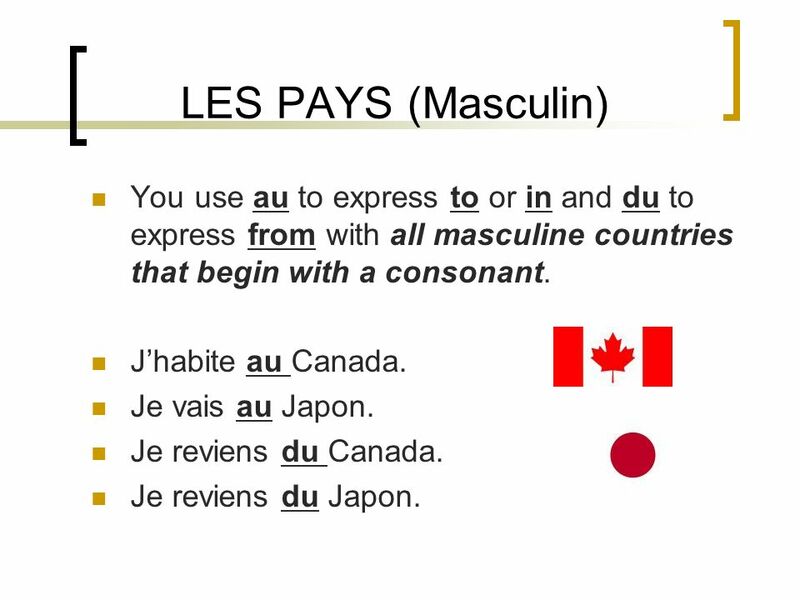 8 LES PAYS (Masculin) You use au to express to or in and du to express from with all masculine countries that begin with a consonant. Jhabite au Canada. Je vais au Japon. Je reviens du Canada. Je reviens du Japon. 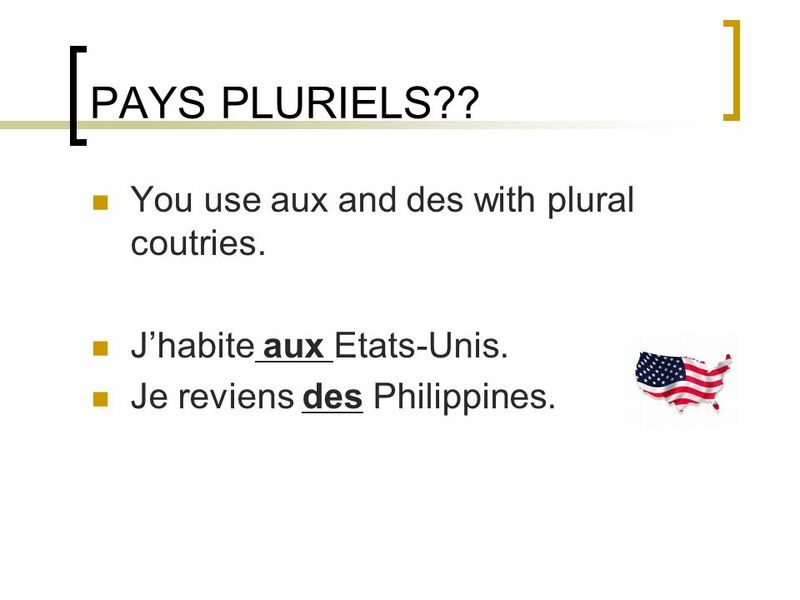 9 PAYS PLURIELS?? You use aux and des with plural coutries. Jhabite aux Etats-Unis. Je reviens des Philippines. Download ppt "REMEMBER THESE? a: in or to: Je vais a lécole. Je suis a la maison. De: from: Je reviens du supermarché. 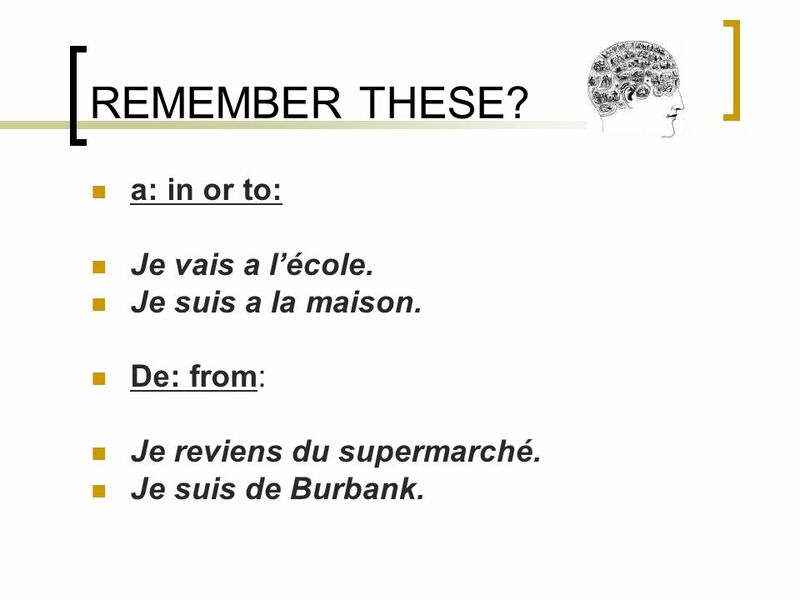 Je suis de Burbank." 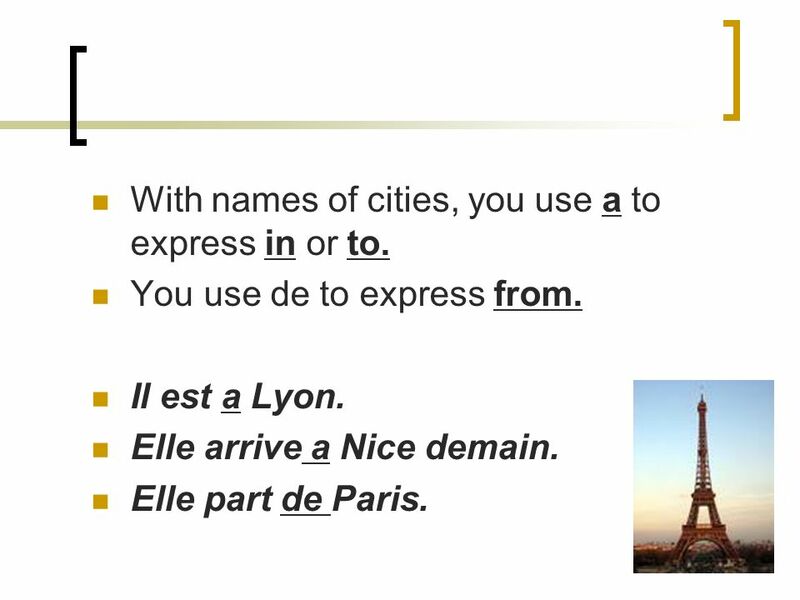 Y et en chapitre 5. en : 1.replaces du, de l, de la, des, de and noun after it 2. replaces noun after a number. Il cherche des livres. Il en cherche. Le collège Le coll Le collège. Asking the way There are four main ways of asking the way: 1) Pour aller au (m) marché? à la (f) poste? à l (vowel) église? Pronoms sujets Subject Pronouns. The subject of a sentence is the person or thing which performs the action. 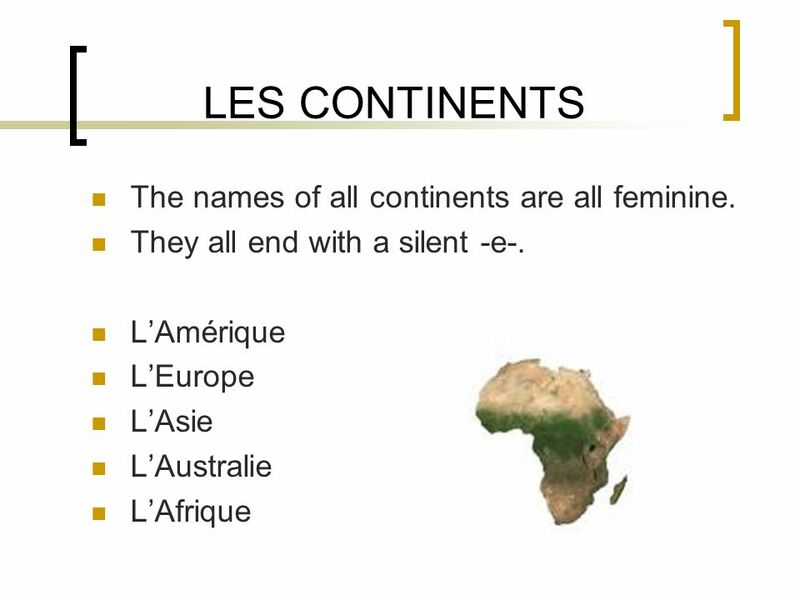 Les contractions À et de À Meanings: to, in, at Contracted with le (the) and les (the) Does not change with la (the) or l (the). May be used with many. When followed by the definite articles le and les, de contracts with them into a single word: de + le=du du salon de + les=des des villes But de does. 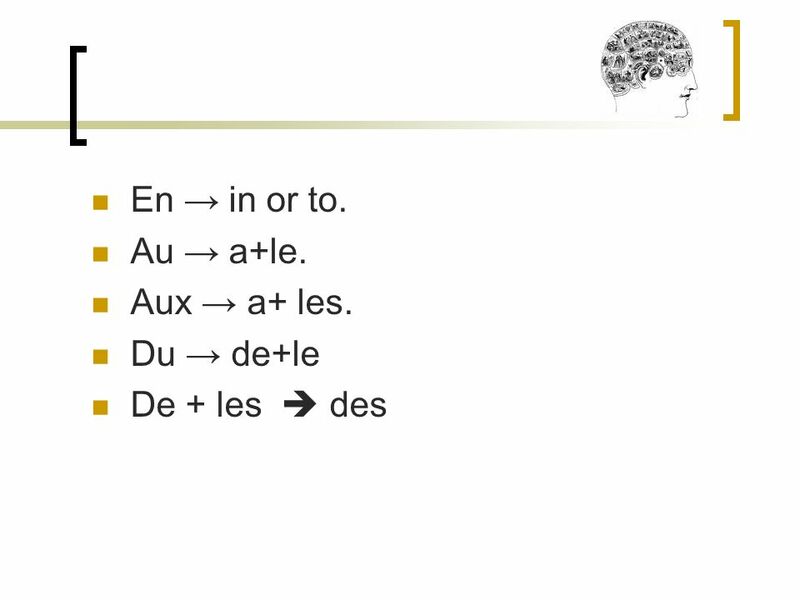 ************ LA CONTRACTION à + le > au 2. à + les > aux 3. de + le > du 4. de + les > des. - LIMPARFAIT ET LE PASSÉ COMPOSÉ - LE VERBE VENIR - LES PÉPOSITIONS GÉOGRAPHIQUES Chapter 4 Review. 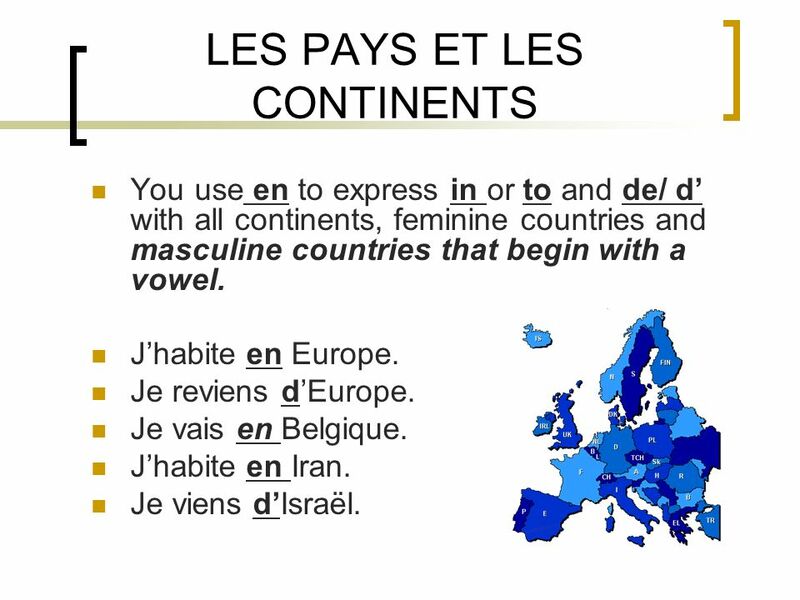 WALT: RECOGNISE WORDS FOR OTHER COUNTRIES AND NATIONALITIES IN FRENCH AND SAY IF I HAVE BEEN TO THEM OR IF I AM GOING TO GO THERE. WILF: OPINIONS FOR LEVEL. The pronouns y and en The pronoun y often represents a location. In this case, it usually means there. Nous allons en Côte d’Ivoire. We go to the Ivory. Les Prepositions: Prepositions are used in expressions which relate to where you are, where you are going and where you are coming from. Les emplois du present : Je chante. Je chante. – I sing. – I do sing. – I am singing. Je suis en train de chanter. Je suis en train de chanter. – Right. To use this powerpoint Open the presentation in normal or edit view. You will see notes for teachers below some of the slides. You can either number the. 1 of 12 © Boardworks Ltd 2006 This icon indicates the slide contains activities created in Flash. These activities are not editable. For more detailed.